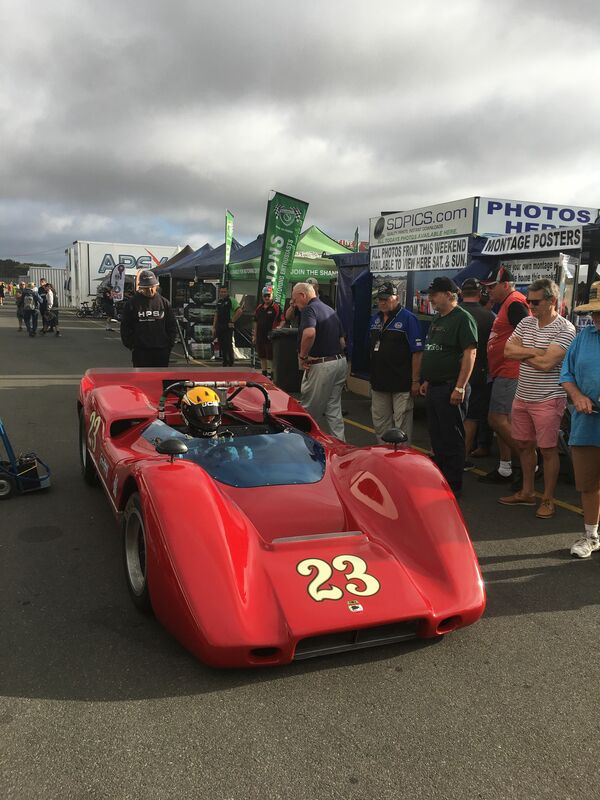 The 2018 historic racing season in Australia again started with the largest meeting of them all, the Phillip Island Classic. Guido Belgirono-Nettis ready to practice the ex Alberto 1985 Ferrari 156 GP (yes, that’s the ex Johansson car he would race during the weekend in the garage. Whilst a little down at 420 approx entries (recently averaged the 500 mark) it’s at least another 70 or so more than other meetings of a similar note. 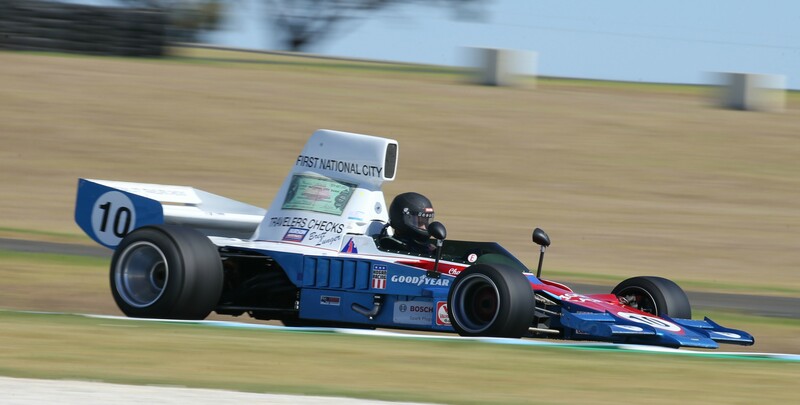 With Formula 5000 now 50 years old, it was a chance to feature this category with their own race. 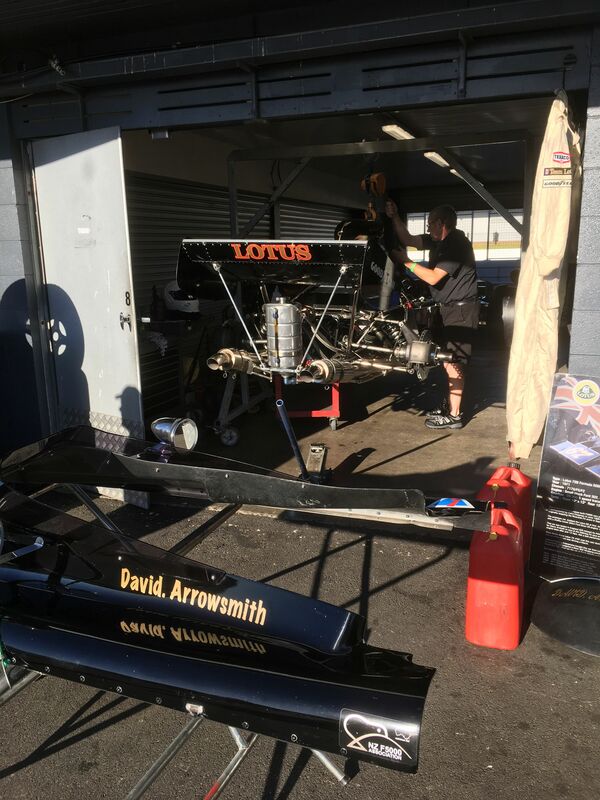 Initially, a large contingent of more than 10 cars were entered for the event from New Zealand, however, as the fifth round of the NZ championship unfolded it duly resulted in a few of the cars not being ready in time to make the journey across the ditch. 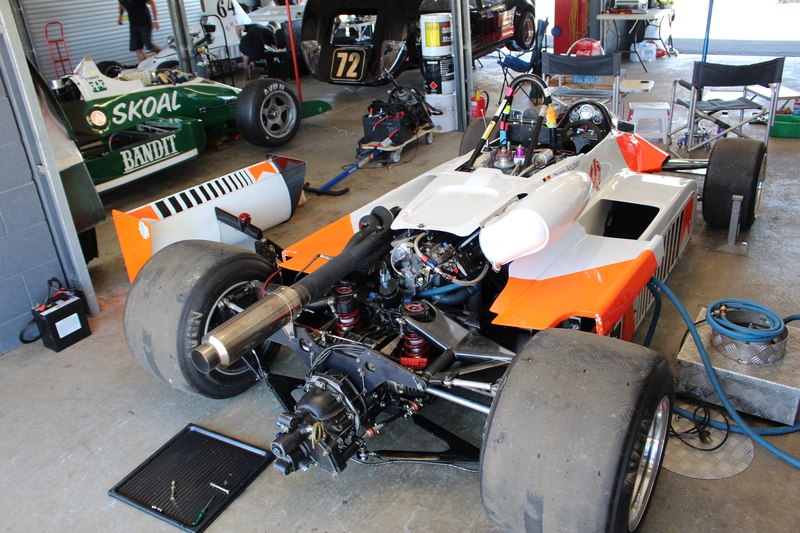 Most notably was one of Phillip Island’s Event Patrons, NZ F5000 legend, Kenny Smith. Smith’s Lola T332 suffering from a broken engine valve at the Skope Classic at Christchurch. As soon as one arrives each year to this event, overwhelmed is the thought that comes to mind of the magnitude of organising and coordinating that must have been done behind the scenes. From the track owner preparing and maintaining such a marvellous venue, the club volunteers bringing truck loads of supplies down from Melbourne, to the various roles performed by volunteers and a handful of paid contractors. Each year, entrants arrive earlier, thus officials are there for longer, with some giving up 5-6 days to contribute their part to the event. As the sun shone, the class appeared on track in the 1960S TO 1980S racing car field (aka Groups O, P, Q & R); including the two1985 Ferrari team cars during Fridays qualifying session – the # 27 ex Michele Alberto & #28 ex Stefan Johansson Ferrari 156GP. The #28 car would be owner, Guido Belgiorno-Nettis’ choice for the weekend. Tough competition this year from a number of other Formula One, Atlantic and Indy-cars. Of note was the March 85B of Stephen Borness. A Formula 3000 car (original Team Oreca), it ran on track by Borness to very respectable finishes with its F1 powerhouse engine, the Cosworth-DFV v8. A brace of RALT RT4s competed, with the Don Hume ex Alan Hamilton car being driven to top five placings by the very capable, Tim Macrow. John Bowe stole the show though with a brace of wins in the ex Hans Stuck March 741 F1. Not to be outclassed, the field also included a number of invitedF3 cars from the 1960s; including the BT29 Brabhams of Max Pearson & Wayne Wilson (NSW CAMS Historic Commission rep), and the Tasman car, BT31 of Peter Strauss. The pre-WWII & early post-WWII grid provided some real highlights. The duel at the front was close fought between the Aussie-specials and a Tasman series car. The Aussie specials had the muster for most of the weekend, the Dalro Jaguar of Les Wright and Faux Pas, the Cooper-engined car of Mal Reid swapping wins. Adam Berryman had a spin early in the weekend in the famous Cooper T70, recovering to take a race win in the final race Sunday. This T70 was designed and built by Bruce McLaren at the Cooper factory before McLaren went out and produced under his own name – appropriately this T70 is dubbed “the first McLaren car”. Notable stars from the past were on track; including , John Bowe in the ex. Carroll Shelby Allard J2X-Cadillac. But it was 1983 Le Mans 24 Hour winner, Vern Schuppan driving his ex Doug Whiteford Lago Talbot GP car. Having acquired the car two years ago he’s now embarked on a cosmetic freshen-up, which included tracing the car has all bar one of its matching number panels. Both Schuppan and Bowe had consistent top-ten finishes across the weekend. 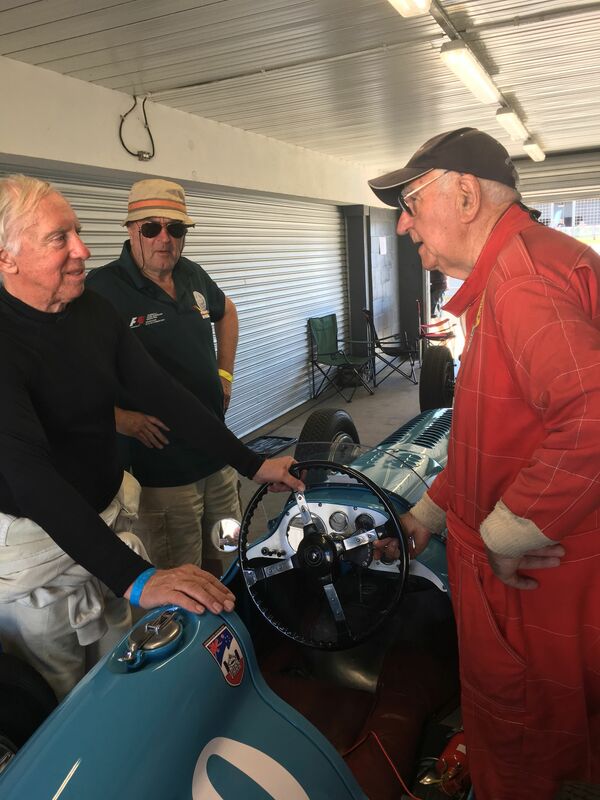 Vern Schuppan (left) getting some tips from ex owner, Ron Townley on how to best use the pre-selector gearbox in the Lago Talbot T26 GP car. Gordon Halstein in the background. Andy Newall (UK) put in a guest appearance driving Bob Harborow’s McLaren M6B, but this wasn’t enough to secure the car some race wins, notwithstanding some mechanical gremlins across the weekend, but there was also the later model, M8F at 8.4 litres to contend with. Dutton Motorsport were out in force this year with no less than three cars entered in this 1960s-1980s sports-racing car field. The McLaren M8F being driven so capably by Taswegian, Jason White. George Nakas was also on-track in the Porsche 962C (which finished 3rd overall at the 1988 Le Mans 24 Hour race), and Dutton Motorsport Manager, Ben Hansen steered the pretty, ‘long-winged’, Lola T296. Laurie Bennett, in the much earlier McLaren M1B finished very well inside the top six. There was also some fine, close racing from a number of other categories; including Formula Ford, Group S (1960s-1970s production sports cars) and the under 3-litre historic touring cars. Andy Newall moving the crowd back in this McLaren M6B. Australian pair Tom Tweedie (Chevron B24/28 #2) and Tim Berryman (Lola T332) lead a warm up lap at MG hairpin. 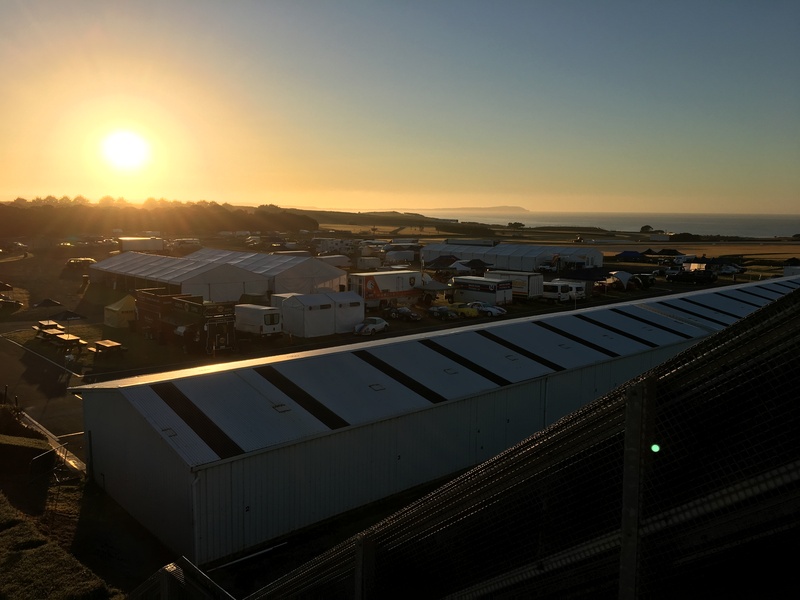 Australia’s Phillip Island circuit proved the perfect venue for the final round of this season’s SAS Autoparts MSC NZ F5000 Tasman Cup Revival Series over the March 10-11 weekend. ‘This place is just off the scale,” said Kiwi racer Aaron Burson (McRae GM1) after a weekend best second place finish in the feature length 12-lap F5000 category final on Sunday afternoon. “It’s just so different to what we have at home. And it’s hard to pick one bit that I like more than another, the whole place is spectacular. For a start, at almost 4.5 kms around the lap is a lot longer and it’s got lots of elevation changes which you don’t see from watching the V8s when they are here. That, and all the fast, flowing high entry speed corners means it’s completely different to the other tracks we race at. The circuit, on Phillip Island, due south of Melbourne, could well have been built for the robust, stock-block V8-powered wings-and-slicks Formula 5000 single-seaters. Category original Chas Talbot enjoyed being back behind the wheel of his ‘new’ Lola T332. Weekend pace-setter, former Australian Formula 3 race winner Tom Tweedie (Chevron B24/28), was consistently the fastest man at the meeting, qualifying quickest before going on to win all five category races very much as he pleased and only conceding the fastest race lap once – to compatriot Tim Berryman (Lola T332) in the second race of the weekend on Saturday morning. Tweedie was the only one to break the 1.27.00 barrier (with his pole time in the Saturday morning qualifying session of 1.26.89251. but both he and Berryman ran easily in the 1.27.00s in the races. 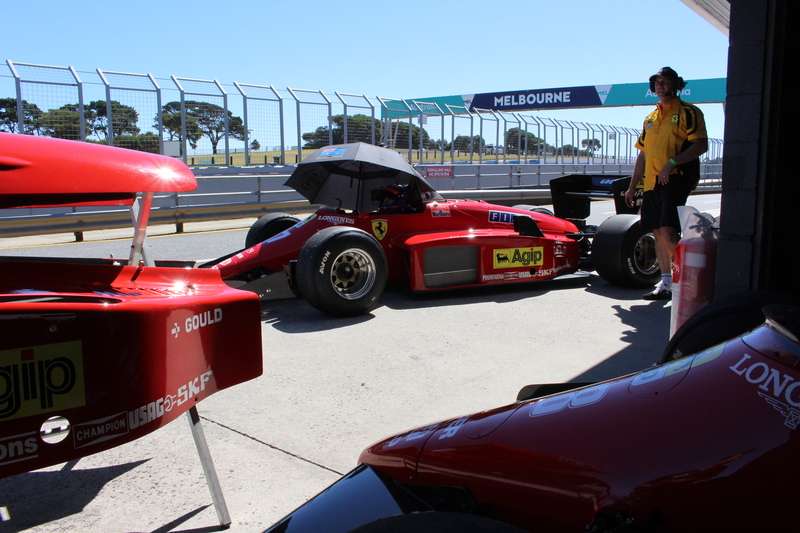 Both also beat the two Formula 1 cars – the March 741 of former V8 Supercars ace John Bowe and the Ferrari 156/85 of Sydney driver Guido Belgiorno-Nettis – which joined the F5000 field for the first race on Sunday morning. Like the other four races (a 4-lapper ‘sprint’ on Friday then two five lappers on Saturday, and a third five lapper on Sunday morning) the 12-lap 2018 Phillip Island Classic on Sunday afternoon was another Tweedie master class, the Sydney stock broker leading all 12 laps. Until the first lap of the feature final Berryman had tucked in behind to head the rest of the 19-strong field home. In the final however, he was forced to pit to retether his car’s fire extinguisher and could only make it back up to 10th place before the chequered flag came out. That left the way open for Aaron Burson to take second place ahead of fellow Kiwis Ian Clements, Tony Galbraith (both Lola T332s) and David Arrowsmith (Lotus). Kiwi Aaron Burson scored a weekend-best second place in the feature final at the Phillip Island Classic meeting on Sunday. After working through gear selection then electrical issues on Friday and Saturday Arrowsmith was back to his giant-killing best in his older Class A car on Sunday, winning an entertaining battle with fellow Kiwi Tony Galbraith for seventh spot in the morning 5-lapper, then finishing a weekend-best fifth – after another race-long battle, this time with Australian ace Dean Camm (Chevron B24) in the feature final. Behind Camm was another entertaining battle for track and race position, eventually decided in the favour of Kiwi Brett Willis (Lola T330) from Aussie Frank Harris in his Chevron B24). Category original Charles Talbot (Lola T332) rounded out the feature race finishers with just three starters failing to finish. Kiwi Grant Martin finally called time on his weekend when he ended up with just one usable gear (4th) while Australian Michael Glynn (Elfin MR8) had a wild ride exiting Turn 1 when a wheel bearing collapsed and pitched his car off the track and into a barrier. 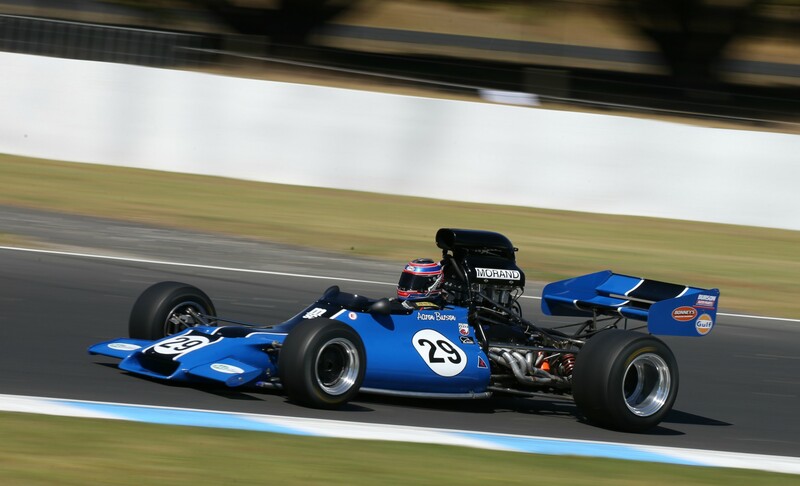 The VHRR’s annual Phillip Island Classic meeting hosted the final round of this season’s SAS Autoparts MSC NZ F5000 Tasman Cup Revival Series. 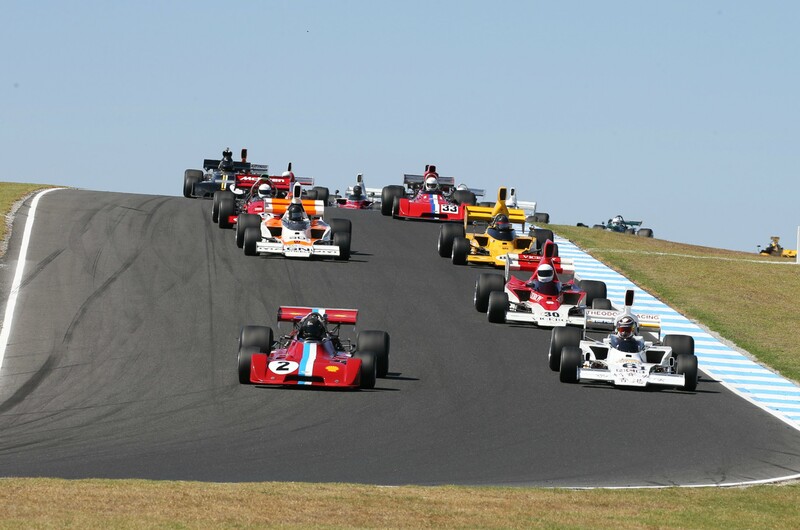 The next outing for members of New Zealand’s Formula 5000 Association is to the Rolex Monterey Motorsports Reunion meeting at the Laguna Seca circuit in northern California in August where they will get to celebrate the 50th anniversary of the Formula 5000 category with fellow owners, drivers and fans from the United States and Europe.